This application note describes how the nanodac recorder/controller can be used to measure and control the consistency of a material such as cement. 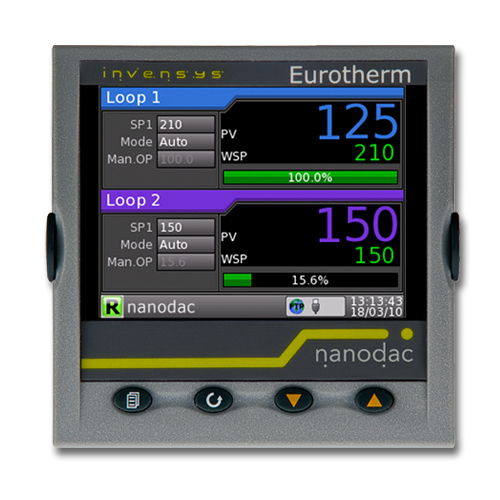 The nanodac recorder/controller provides combined recording and control in a single ¼ DIN package. It is ideal for use on any application requiring up to four real universal inputs. There are two control loops one of which may be used in PID mode to control temperature and the other in on/off mode to control pressure. A third input is used to measure viscosity and to provide an alarm output when a set level is reached. The multi-channel recording facility produces a record of the thickening time/temperature data which can be stored in either open CSV format or in a secure (UHH), check summed format to protect data integrity. This provides secure records of the process conditions. The data can be archived to a computer or server by means of FTP protocol (Remote Archiving) or to a ‘memory stick’ plugged into the USB port at the rear of the recorder (Local Archiving). The archived data remains in the flash (50MB) memory of the instrument and can be reviewed directly on the instrument display. The archive data can also include actual values from real or communications channels (PV), Alarm Messages, and Operator Input Messages all of which are accurately dated and time stamped from the on-board real time clock. As an oil well is being bored, part of the drilling process involves lining the well with cement slurries. During the drilling process, the cement is subjected to severe environmental conditions. Before it can be used off shore, batches must be checked under laboratory conditions to determine the setting qualities under high temperature and pressure conditions to ensure compliance with strict specifications such as API Specification 10. Pressurized cement consistometers are used to evaluate the thickening time or pumping time of a cement slurry under simulated down-hole conditions of temperature and pressure. The testing of cement slurries under these conditions is necessary to ensure that the operator can achieve an efficient and effective cementing application. To ensure comparative results, the cement, cement additives, and mix water used in the slurry design for testing in the consistometer should comprise the same materials and be mixed in the same order as planned for the field application. The slurry is poured into a container and placed into the consistometer. Next, the temperature and pressure are brought to the desired levels. The slurry container is rotated at a constant speed to impart circulation to the cement in the slurry container. The temperature control loop controls the rate of rise of temperature in the slurry. When it reaches the set level the control loop automatically holds the temperature at that level until the cement sets. Control of pressure is maintained by adjusting the air pressure to a pump and by operating a pressure relief valve. The consistency (viscosity) of the cement is determined by measuring the torsion generated by the slurry pressing against a standard paddle as the slurry container is rotated. In this example the nanodac recorder/controller has two control loops. One loop (Loop 1) is configured for PID temperature control. The input is supplied from a thermocouple mounted in the wall of the container and heating is via a solid state relay. Setpoint rate limit controls the rate of rise of temperature. The second loop (Loop 2) measures pressure from a 0-100mV transducer which represents a range of 0-40,000psi. In the case of the nanodac instrument the transducer excitation voltage would normally be supplied externally. Two relay control outputs provide pressure raise and pressure lower.